Here at Apple Tree School, we are a proud Christian school that excels in early childhood education. We oftentimes get comments on how we’ve helped turn students around with behavioral issues and helped them become better students. We would love to take all the credit, but in truth, a huge amount of the success comes from the home and not the classroom. In today’s blog, we want to offer a few tips to help out parents struggling with their children’s behavioral issues. One of the leading causes of bad behavior is the need for attention. This doesn’t mean that your child is self-centered because the need is normal. Children need to feel like they belong and like they are getting attention from their parents. More so, they need to have positive contact (like a walk, video games, or even just talking) and an emotional connection that is simply a part of human biology (and a very good part at that). When the child acts out for the attention, it’s the attention in the form of discipline that they are seeking, which is why other efforts and punishments won’t work. Helping children understand that they are part of a group is important. We make sure that everyone pitches in while cleaning the schoolhouse and tending our organic garden, and it’s important that your children pitch in as well. Not only does it teach basic skills, prevents “affluenza” and other entitlement issues, but it brings the family together. One commonly successful method is group work like doing the dishes together. You know this from the day one of having a child. Sleep is critical to not being cranky, feeling unwell, being able to focus, and a range of other positive health benefits. Sleep is especially important in the early years when children are growing by leaps and bounds. When the body doesn’t get what it needs, it signals it in a number of uncomfortable ways that spell behavior issues. Slowly making bedtime earlier and earlier can help your child behave better, feel better, and focus better. Like sleep, good nutrition can be a real game changer and is based on the simple idea of helping your child behave better by helping them feel better. Here at the Apple Tree School, we prepare healthy meals and even have our own organic garden that we tend with the children. That way your child is witnessing the fruits of consistent labor and eating about as healthy as possible. Not only do children feel better with a healthy diet, and therefore, act out less, they are getting the nutrients they need to really focus and think, which helps them work through decisions and consequences, and excel in school. 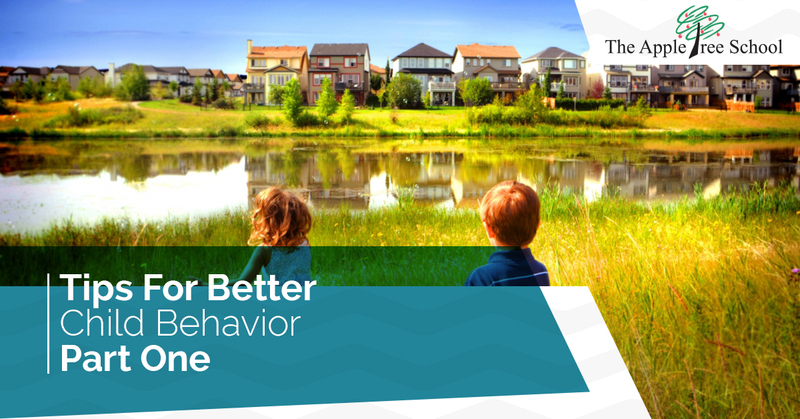 Stay tuned for the Apple Tree School’s second part of our tips for better child behavior. If you are in the Houston Area and are looking for a better Christian school that provides a superb start to life and an excellent private education, look no further than us. Feel free to contact us with more questions or schedule a visit.